A bride’s wedding day is likely to be one of the most important and memorable events in her life. A big part of that day, and one of the fondest memories for many brides, is how stunning they looked in their wedding dress. A wedding dress is not only one of the centrepieces of the day, it’s also a pretty major investment for a lot of people and should be well looked after, not only after the ceremony, but more importantly, before. Below are some wedding dress storage tips that will help you keep your gown looking immaculate for when the big day arrives. These are fantastic options for storing your wedding dress before the big day because they are light, breathable cotton garment bags that run virtually no risk of damaging your dress before the big day. These are great for short-to-medium term storage, but for long-term storage, you will want to look into a chest. If you are keeping your wedding dress in a self-storage unit during the lead up to the wedding, it makes sense to invest in a unit that comes with climate controlled storage. This makes even more sense if you are planning on storing the dress long term and it is going to be sitting through a wide range of seasonal and climatic changes. If you live in a region that experiences incredibly hot and humid summers, or even cold and humid winters and springs, you will want to ensure that your dress is not being compromised by the humidity. This seems so common sense that it is not even worth mentioning, but you would be surprised at how many people lay their dresses flat instead of hanging them up for storage. If you lay your wedding dress flat before your wedding, don’t be surprised if you remove a dress that looks wrinkled and less than flattering. As with any piece of important clothing, it should go into storage cleaning and with all of the wrinkles ironed out of it. 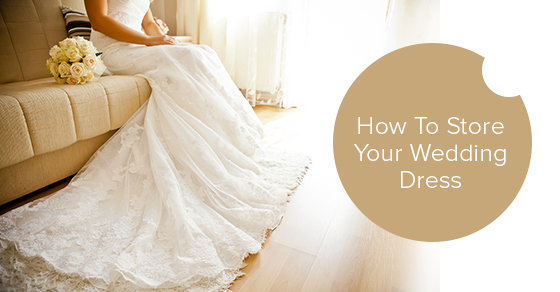 Wrinkles become harder to remove the longer they are allowed to sit in clothing, and putting a dirty wedding dress into storage means that you are going to have to clean it when it comes time to take it out. Your big day needs you looking your best, and part of looking your best is having a wedding dress that looks perfect. In order to ensure that your dress looks as beautiful as you do on your wedding, keep the above storage tips in mind.